Bijlmermonument is a monument to the people who died or lost their houses in the 1992 disaster in which a Boeing 747F jumbo freighter crashed into two flats in the Bijlmer. Bijlmermonument is a monument to the people who died or lost their houses in the 1992 disaster in which a Boeing 747F jumbo freighter crashed into two flats in the Bijlmer. 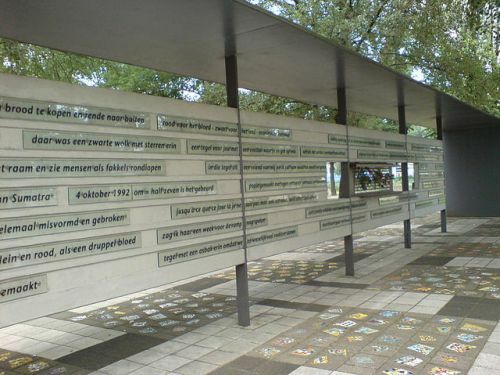 The monument was designed by architect Herman Hertzberger and is built around a tree that survived the crash, with the names of the known victims and mosaics laid by survivors. The foundations of the destroyed buildings are also still visible.